Small art shows are good for the soul. The current Pre-Raphaelite exhibition familiarizes the public with the Met’s small collection of the the neglected movement that galvanized Britain during the second half of the twentieth century. The members of the group were discontent with the shallow, meaningless, academic, and realistic art of their time. They harked back to what they believed was the spirituality and idealism of the “pre-Rafael” Middle Ages and early Renaissance. The artists celebrated beauty, especially that of women, depicted in most of the items displayed. They are gorgeous, sensuous and seemingly unattainable. 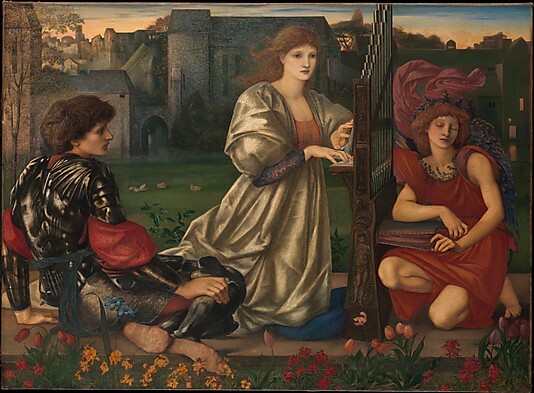 The centerpiece of the Met’s show is The Love Song by Burne-Jones, acquired in 1947. It is inspired by the stanzas of a French folk ballad: Alas I know a love song / Sad or happy each in turn. A stately dressed, harp-playing woman is flanked by an adoring knight wearing equally dramatic medieval clothes and a more scantily dressed maiden who listens attentively. A castle and a meadow dotted with sheep fill the background, while lovingly detailed flowers occupy the foreground. Experts compare the work to Venetian paintings of the 16th – 17th century. Sensuous portraits of women in pastels, watercolors, and ink demonstrate the matchless draftsmanship of these artists. Highlighted are three paintings by Rossetti, Ford Madox Brown and Burne-Jones. The composition of one of them, Rossetti’s 1867 portrait Lady Lilith, of a woman who combs her golden hair while examining herself in a hand mirror, is identical to that of Gustave Courbet’s Jo, The Beautiful Irish Girl. The latter, painted in 1865, is one of the French painter’s most iconic works. One wonders whether the relationship is purely accidental. Like many of the movements that would succeed them (Art Nouveau, Deco, Jugendstil, Arts and Craft), the Pre-Raphaelites advocated an overall approach to art. It is this aspect of their activities that descended to our own times. William Morris headed a workshop that produced stained glass windows, tapestries, fabrics and wallpaper. Some of these designs are still actively marketed. The couch in my summer home, for example, is covered in an authentic William Morris fabric. The show at the Metropolitan Museum of Art runs from May 20 to October 26, 2014. This entry was posted in Art review and tagged art, art exhibits, art museums, british art, burne-jones, dante gabriel rossetti, delaware art museum, edward burne-jones, european art, ford madox brown, gustave courbet, lady lilith, metropolitan museum of art, nyc art exhibits, prb, pre-raphaelite art, pre-raphaelite brotherhood, pre-raphaelites, rossetti, samuel bancroft, the love song, william morris. Bookmark the permalink.